This dog does not carry the Mutation for improper coat and will therefore have furnishings (proper coat). However, the overall coat type of this dog is dependent on the combination of this dog's genotypes at the L, Cu, and IC loci. This dog will pass F (furnishings, proper coat) on to 100% of its offspring. This dog carries one copy of the mutation for improper coat (IC) and one copy of F and will therefore have furnishings (proper coat). However, the overall coat type of this dog is dependent on the combination of this dog's genotypes at the L, Cu, and IC loci. This dog will pass IC (improper coat) on to 50% of its offspring and F (furnishings, proper coat) on to 50% of its offspring. Therefore, this dog can produce puppies with improper coat if bred with a dog that carries one copy (F/IC) or two copies (IC/IC) of the mutation for improper coat. This dog carries two copies of IC and will therefore have no furnishings (improper coat). 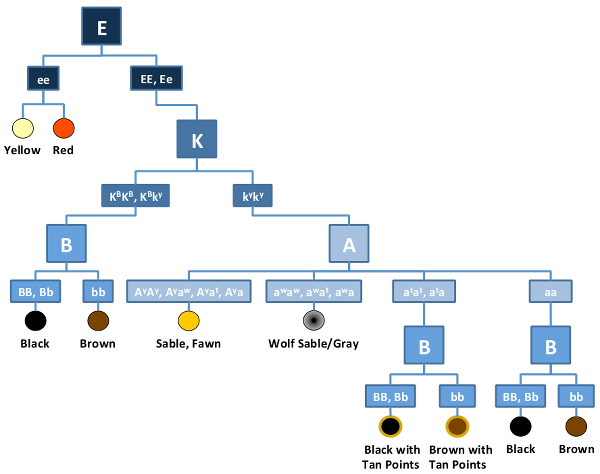 However, the overall coat type of this dog is dependent on the combination of this dog's genotypes at the L, Cu, and IC loci. This dog will pass IC (improper coat) on to 100% of its offspring and can produce puppies with improper coat if bred with a dog that carries one copy (F/IC) or two copies (IC/IC) of the mutation for improper coat. The improper coat/furnishings (IC) Locus determines if a dog will have longer hair around the muzzle and eyebrows (facial furnishings) or a lack of furnishings (called improper coat in breeds for which facial furnishings are standard). A DNA variant in the RSPO2 gene, which functions in hair follicle development, results in the production of furnishings in multiple breeds and is found in all wire-haired dogs. Genetic testing of the IC Locus for the RSPO2 gene variant will reliably determine whether a dog has furnishings or improper coat and whether or not a dog has furnishings and is a Carrier of improper coat. Facial furnishings are inherited in an Autosomal Dominant fashion, meaning only one copy of the RSPO2 variant is required to produce furnishings. Improper coat is, therefore, recessive to furnishings, meaning two copies of IC are required to inherit an improper coat and dogs with furnishings can be carriers of improper coat that can be passed on to their offspring.